Rare earth elements — elements like scandium, neodymium, and dysprosium — have found their way into every aspect of our daily lives, from the highly visible, like smartphones and fluorescent lamps, to the seemingly invisible: hybrid cars, rechargeable batteries, and wind turbines. There are even cancer treatments requiring rare earth elements. Contrary to their name, however, rare earth metals are not actually rare. Or at least, not exactly. On average, they’re about as common as copper or nickel in the Earth’s crust. But unlike copper or nickel, rare earth elements don’t occur in mine-able pockets, meaning that obtaining them is a lot more expensive and labor-intensive. On top of that, when you do find them in ores they’re all mixed together and separating them can be a challenge: they’re all about the same size, have similar melting points, and tend to form trivalent cations (meaning they also look identical electrochemically). In fact, it took decades to correctly identify and separate the rare earth elements from each other. In the 1800s, there were dozens of false discoveries, perhaps over 100. Today, these elements play a critical role in a number of booming, profitable technology industries. The European Union and the United States have both labeled rare earth elements “critical materials,” an on-the-nose, but ominous, title. To date, just a few countries have been able to mine them; China has dominated the market since the 1990s and today supplies about 85 percent of the world’s rare earth materials. This has pushed researchers (myself included) to look for new and creative ways to obtain a more stable supply of rare earth elements, from recycling electronics to going through waste products from other industries. A team of researchers from Japan recently took their search to the bottom of the sea. By punching 10-meter-deep sediment cores into the sea floor and mapping that data onto GIS maps, the group identified an area of about 2500 square kilometers (roughly 960 square miles) sitting squarely in the Japanese Exclusive Economic Zone that contains more than 16 million tons of rare earth elements. 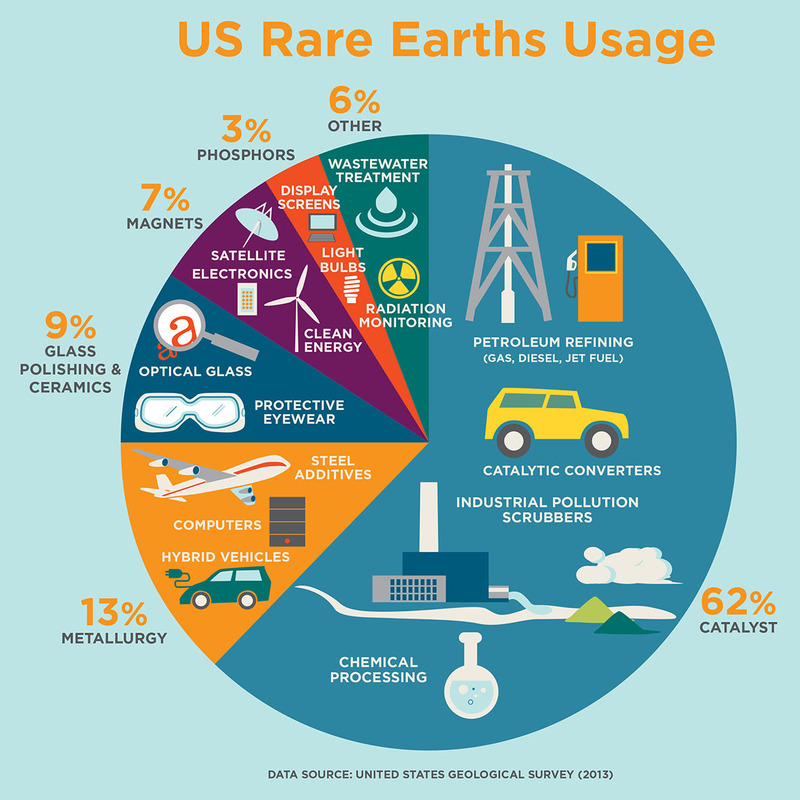 This is five times the total amount of rare earth elements that we’ve produced globally since 1900, according to USGS records. The site is fairly remote — over 150 miles south of Minamitori Island, the nearest body of land — which means actually extracting the rare earth elements, buried 6-12 feet deep in sediment under four miles of water, won’t be easy. Figuring out how to do it is next for the Japanese, and according to a study in Nature’s Scientific Reports, feasibility studies will be conducted over the next five years. In the meantime, researchers in the United States have taken a different tack: looking for rare earth elements in coal fly ash, a byproduct of burning coal for power. Coal fly ash has a nasty habit of leaching toxins like lead, cadmium, and arsenic into groundwater, harming nearby communities if not stored properly. Part of this is because these toxins hyper-concentrate in the ash. We don’t let them escape into the atmosphere with the gases, and the solids have to end up somewhere. Importantly, though, just like the bad stuff hyper-concentrates, so do rare earth elements. There have been some ashes found to be as concentrated in rare earth elements as the ores we mine, making them a potentially viable source of these rare earth elements. That is, if we can find a good way to get the rare earth elements out that is economically feasible. In the Japanese mud, the elements have adsorbed (think Velcro-d) onto mineral grains from the shells of ancient marine organisms; in the coal fly ash, however, the rare earth elements are embedded in the ash particles themselves. No easy Velcro peel-off here. There are some extraction methods around that do work, but they involve harsh components or conditions like strong acids, high heat, and pressure, factors that make this process infeasible on an industrial scale (nobody wants a giant vat of acid around). They also use a lot of chemicals, generating even more waste since most extracting agents can’t be re-used. There’s been a big push in the U.S. to improve these methods, to the tune of over $17 million dollars, and there is even some initial success. Without finding new sources of rare earth elements, it’s not just technologies that make our lives easier — like smartphones and fancy screens — that are at risk, but our transition to green energy technologies. Rare earth elements are critical for better batteries and permanent magnets, both important components for innovations like electric cars (each Prius contains two pounds of neodymium and around 25 pounds of lanthanum) and wind turbines (over 450 pounds of neodymium are needed per megawatt of capacity). If we’re serious about climate change and clean energy, we can’t ignore the scarcity issue of rare earth elements. Hopefully we’ll dig up the answer somewhere, whether it’s buried in mud or ash.